"Profile of the Bella Principessa" is among of the biggest art surprises in 2009. In 2007, the Canadian art collector Peter Silverman bought the painting from a New York art dealer, Kate Ganz, for about $ 19 000 on behalf of anonymous Swiss collector. In the time of the purchase the painting was considered as an eighteenth-century German work from an unknown author, but Silverman was convinced that it is older and suspiciously resembling Leonardo Da Vinci's art. 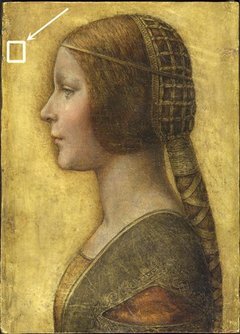 When experts from Lumiere Technology laboratory examined the painting earlier this year (2009) they concluded that "Bella Principessa" is indeed a Leonardo's drawing. The evidence they have found is a fingerprint on the canvas identical to the Leonardo's fingerprint on his painting "St. Jerome", now exposed in the Vatican. They also noticed that it was made by left-handed artist and the stylistic elements resemble closely Leonardo's. The carbon analysis of the canvas showed that it is dating from between 1440 and 1650. Peter Paul Biro, a Montreal-based forensic art expert, said for the Associated Press that the painting is priceless. There are not so many Leonardo works and this canvas will cost perhaps 150 million dollars. "Nothing that I have seen or read in the past two years has changed my mind, I do not believe that this drawing is by Leonardo da Vinci," said Kate Ganz for The Associated Press.